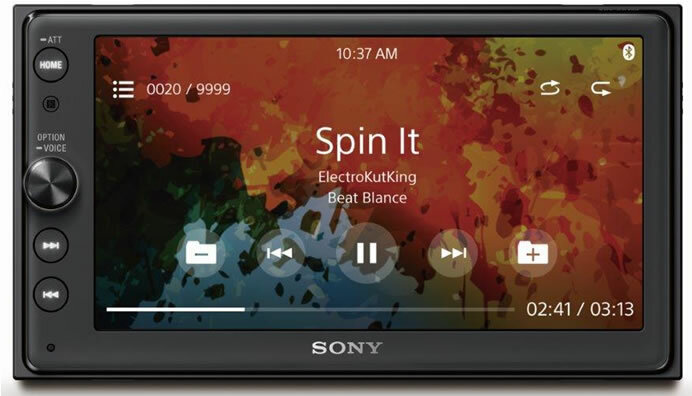 The new Sony XAV-AX100 in-car audio system offers the latest smartphone connectivity with the best user interface, the ability to play a variety of media files and get the most up-to-date information on-the-go. The Sony XAV-AX100’s high power sound and EXTRA BASS feature will transform your vehicle into an elaborate sound system, all while making your drive as safe and comfortable as possible with rotation volume control and voice command features. The XAV-AX100’s clear and responsive touchscreen create a simple and safe user interface. Its lighter touch operation and improved visibility helps improve late night drives and glaring sunshine. Connecting your phone to your car has never been better with the option of Apple CarPlay .CarPlay allows you to use your phone in a safe and smart way whilst staying focused on the road, letting you access Apple Music, Maps, make phone calls, and send messages all through the touchscreen, or vocally with Siri. Android Auto extends the Android platform into the car in a way that’s purpose-built for driving. With a simple and intuitive interface and powerful new voice actions, it’s designed to minimize distraction so you can stay focused on the road. High power sound comes full throttle with the XAV-AX100 in-car audio system. 55watts x 4 Dynamic Reality Amp 2 and EXTRA BASS low boost circuitry overcome engine noise and reproduce clear sound at any volume level with deep and punchy bass. The 10-band graphic equalizer gives an astonishing variety of sound, perfectly complementing EXTRA BASS for an enjoyable drive. 3-pre out connectivity allows system expandability to connect external amplifiers with a wide range of speaker connections, allowing sound enthusiasts to build their own bespoke system. The Sony XAV-AX100 in-car audio system retails at $499.99 and will be available across North America as of late November.